Patagonia is a well known and respected outdoor gear brand that sells sustainable outdoor clothing. It was founded in 1973 by Yvon Chouinard who was a founding member of One Percent for the Planet. They originally began as a climbing gear brand and have since branched out into all outdoor wear. Patagonia commits 10% of its profit or 1% of its sales, whichever is more, to environmental groups. People who love the outdoors, love Patagonia and everything they do. Their mission statement is: Build the best product, cause no unnecessary harm, use business to inspire and implement solutions to the environmental crisis. They focus heavily on finding and sourcing the best products from suppliers that use ethical principles. 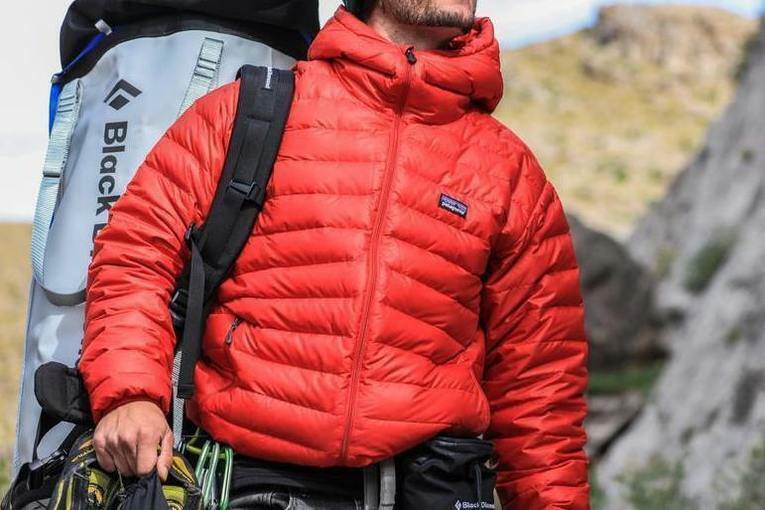 If you’ve been in the market for a lightweight down jacket, Patagonia is a great place to start. They’re Nano Puff and Down Sweater are similar in design and high in quality, yet have some noticeable differences. If you want to find a great lightweight down jacket and aren’t sure which one to pick, we’ve taken a close look at each jacket so you can make an informed decision. Which lightweight down jacket is right for you? Puffy jackets, down jackets, puffer jacket: Whatever you choose to call them, are lightweight cold weather options that provide excellent warmth while being durable and versatile. They make awesome companions on epic outdoor adventures and double as an everyday wear jacket. If you don’t have a lightweight down jacket, you should consider investing in one. With lightweight down fibers as insulation they trap the air in and make you feel like you never left the house, they’re that warm. The material and design have the added benefit of being extremely packable, as each of these jackets comes with a pocket designed as a stuff sack for the jacket. They may be a little on the pricey side, however, you get what you pay for. Down lasts significantly longer than synthetic blends. A down jacket can retain its warmth for 10-20 years while synthetics last 5-7. Patagonia is a respected player in the outdoor gear game. They offer gear for every type of outdoor excursion and their down jackets are respected. If you are interested in two of their most popular choices in the lightweight down jacket category, we’ve broken down their similarities and differences below. The biggest draw for getting yourself a down jacket is the unparalleled heat retention that down fibers offer. Down is considered nature’s best insulator and is found in the fine layer of feathers that rest underneath the exterior feather of birds. Patagonia and other brands have changed the manufacturing of their product lines to eliminate the use of live-plucked downs. The loose structure of down feathers traps air and provides excellent insulation properties. Down is warm, lightweight, and extremely packable, three important qualities when choosing your outdoor gear. When down is taken care of, it can last up to three times longer than its synthetic counterparts. The type of insulation directly affects a number of variables: Warmth, water resistance, weight, packability, and price. Real down has a higher warmth-to-weight ration while synthetic fill is quick-drying. The biggest difference between synthetic down and real down is that synthetic down does a better job of maintaining the insulation when it gets wet. Keep in mind, that both will still offer a decent amount of warmth when they do get wet, however, the Nano Puff has the upper hand here. To determine which one is the best fit for your needs, take into consideration where you’re going, how much weight you’ll be taking, and how much you want to spend. If you are looking for an in-depth breakdown of the major differences of down REI does a fantastic job. The weight of down makes these jackets extremely lightweight when compared to jackets made of other material. If you’re spending all day outdoors, keeping your gear as light as possible is the best option. There are slight differences in the weight of real down and synthetic down, however, in this case, the weight difference is so minute that it really doesn’t make a difference. Ripstop threading is a lightweight, nylon threaded material that is resistant to tearing and ripping. It can be water resistant and is popular in outdoor gear such as lightweight jackets and sleeping bags. It’s made by weaving nylon threads throughout the base of the jacket into interlocking patterns. The Down Sweater offers ripstop threading and the Nano Puff doesn’t. While it would have been nice to have ripstop threading on both, the stitching of the Nano Puff is stitched in small squares that crisscross the surface of the jacket, so a small tear isn’t the end of the world and is contained within the stitched rectangles. If a little down gets out, the jacket will still work just fine. Water resistance is the amount of water a jacket is going to repel. The basic rule of thumb is that a jacket should be able to withstand light rain or snow. That being said, most jackets are not completely waterproof and a heavy downpour will eventually soak through unless it’s made of rubber (think crab fisherman). Both of these jackets have a durable water resistant finish on the lining and the shell of the jacket. This means that each one will provide you with moderate protection in light rainfall or snow. Waterproof ratings get a little convoluted, so if you want a little more clarity on waterproof ratings check this article out. Packability of the jacket is dependant on two factors: compressibility and weight. In terms of weight, these jackets are both within a couple ounces of each other. Compressibility is more difficult to measure, however, it’s easily demonstrated in these jackets: each pack down into one of the pockets. The Nano Puff easily stuffs into the left side pocket which and is around the size of a couple cans of soda. It can be compressed further if you have a stuff sack or small pocket in your backpack. The Down Sweater stuffs into the interior chest pocket that comes with a double sided zipper and you can squeeze a little more out of it if you need to. The cuff or wrist of the jacket is one place that air cold air works its way inside. Having an elastic cuff or someway to cinch the wrist of the jacket down comfortably to cover the opening on your wrist plays a big role in keeping the cold air out. Most jackets today offer some sort of elastic or nylon bound cuff and for good reason, it’s super annoying when cold air gets in through the wrist. The Down Sweater comes with nylon-bound elastic cuffs that are form fitting to your wrist. The nylon portion gives the cuff a comfortable feel and the elastic holds firmly around the wrist. The Nano Puff also has stretch bounding around the cuffs that fit comfortably on your wrist. The adjustable drawcord is the little piece of stretchy material that you find at the base of the coat near the bottom of the zipper. You can adjust it to fit the size of your waist so it sits snug around your torso. This is an awesome feature that every jacket ever should include, it gives you the ability to increase airflow on warmer days and cut off airflow during cold days. The hood on a jacket is pretty self-explanatory so we won’t bore you with explaining what a hood is. The base models of both come without a hood, but they also offer hooded options if that’s something you’re into. Now that you have a pretty good idea on what makes these jacket similar and what makes them different, it’s time to make a choice. The Nano Puff has hydrophobic Primaloft gold insulation, it’s built with 55% post-consumer recycled material, in line with Patagonia’s sustainability efforts. There are two hand warmer pockets and an internal pocket that also doubles as a stuff sack. It has DWR properties to help shed water in light rain, however, in heavy rain, you’ll want to layer it with a waterproof shell. It works great as a base layer and you can use it while hanging out around the fire or on a brisk hike in the fall or winter. The biggest differences are it’s slightly lighter, costs less and the synthetic insulation means it will dry quickly if you get wet. The Patagonia Down Sweater is 100% polyester with a DWR ripstop, meaning it does shed light rain but doesn’t fair well in a heavy downpour. They use 800 fill traceable goose down which mean the birds are never force-fed or plucked live, in other words, it’s a sustainable method of harvesting down insulation. There are two zippered pockets down low, as well as, a pocket on the interior of the jacket. The interior pocket also doubles as a small compact stuff sack for the jacket, making the jacket great for use on the go. The fit is regular and is roomy enough to layering in the backcountry. We can’t answer that question for you as everyone is different, however, you should have a better understanding of the similarities and differences and a better idea of which jacket works better for you. You probably noticed there are more similarities than differences, so it’s a win-win no matter which one you choose. Ask yourself where you’re going to be using it, what type of activities you plan on using it for, and how much you want to spend.